A corn is a protective layer of dead skin cells that forms due to repeated friction. It is cone-shaped and has a knobby core that points inward. This core can put pressure on a nerve and cause sharp pain. Corns can develop on the top of, or between, toes. If a corn develops between the toes, it may be kept pliable by the moisture from perspiration and is therefore called a soft corn. 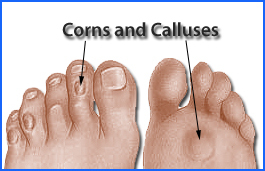 Calluses are composed of the same material as corns; however, they develop on the ball or heel of the foot. The skin on the sole of the foot is ordinarily about 40 times thicker than the skin anywhere else on the body, but a callus can even be twice as thick. A protective callus layer naturally develops to guard against excessive pressure and chafing as people get older and the padding of fat on the bottom of the foot thins out. If calluses get too big or too hard, they may pull and tear the underlying skin. In people with diabetes, the presence of calluses is a strong predictor of ulceration, particularly in those who have a history of foot ulcers. To remove a corn or callus, soak it in very warm water for 5 minutes or more to soften the hardened tissue, then gently sand it with a pumice stone. Several treatments may be necessary. Do not trim corns or calluses with a razor blade or other sharp tool. Non-sterile cutting tools can cause infection, and it is easy to slip and cut too deep, causing excessive bleeding or injury to the toe or foot.